During the conference the invited experts from Austria – H.Kittler and Ph. 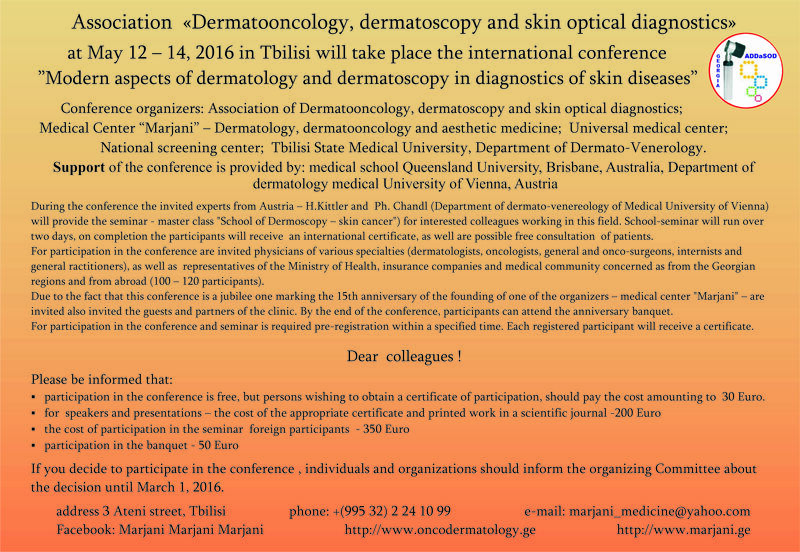 Chandl ( Department of dermato-venereology of Medical University of Vienna ) will provide the seminar - master class "School of Dermoscopy – skin cancer") for interested colleagues working in this field. School-seminar will run over two days, on completion the participants will receive an international certificate, as well are possible free consultation of patients. For participation in the conference are invited physicians of various specialties ( dermatologists, oncologists, general and onco-surgeons, internists and general practitioners), as well as representatives of the Ministry of Health, insurance companies and medical community concerned as from the Georgian regions and from abroad ( 100 – 120 participants). Due to the fact that this conference is a jubilee one marking the 15th anniversary of the founding of one of the organizers – medical center "Marjani" – are invited also invited the guests and partners of the clinic. By the end of the conference, participants can attend the anniversary banquet. For participation in the conference and seminar is required pre-registration within a specified time. Each registered participant will receive a certificate. participation in the conference is free, but persons wishing to obtain a certificate of participation, should pay the cost amounting to 30 Euro. Above mentioned amounts should be transferred to the Bank account of the Association "Dermatooncology, dermatoscopy and skin optical diagnostics" (foreign currency account in Euro) or in Georgian Lari in accordance with the rate established by the National Bank of Georgia on the day of transfer. Note: sponsors enjoy certain privileges – the installation of the stand, indicating the name of the sponsor company in the printed materials and digital products ( announcement on the website, invitation tickets, promotional flyers etc. ), presentation. If you decide to participate in the conference , individuals and organizations should inform the organizing Committee about the decision until March 1, 2016. • to consider and discuss issues of early diagnosis of skin lesions, screening and prevention, the correlation of dermatoscopic and morphological parameters and relationship with internal pathology. • to provide an opportunity for dermatologists, oncologists, surgeons and internists to understand the possibilities and means of optical diagnostics of skin.